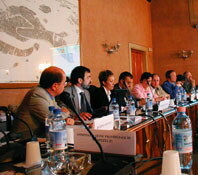 Interreg III is a Community Initiative which aimed to stimulate interregional co-operation in EU between 2000 and 2006. It has been financed under the European Regional Development Fund (ERDF). This new phase of the Interreg initiative aimed at strengthening economic and social cohesion throughout the EU, by fostering the balanced development of the continent through cross-border, transnational and interregional cooperation. A special emphasis has been placed on integrating remote regions and those which share external borders with the candidate Countries. 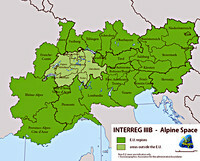 The Alpine Space, as an important transnational European co-operation area, comprises the mountainous area in the geographical sense as well as the surrounding foothills and lowlands, a small part of the Mediterranean coastal area including the Adriatic, parts of the great river valleys of Danube, Po, Adige, Rh�ne and Rhine. The mountainous "core area" is spatially inseparably linked with the surrounding "peri-alpine belt", containing some of the most attractive European metropolitan areas. France: Rh�ne-Alpes, Provence-Alpes-C�te d'Azur, Franche-Comt�, Alsace. Germany: districts of Upper Bavaria and Swabia (in Bavaria), T�bingen and Freiburg (in Baden-W�rttemberg). Italy: Lombardia, Friuli-Venezia Giulia, Veneto, Trentino - Alto Adige, Valle d'Aosta, Piemonte, Liguria.